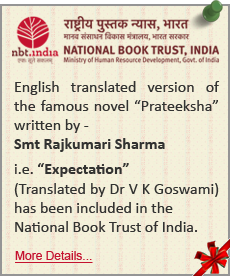 The Hindi classic ‘Prateeksha’, written by the eminent writer Mrs. Rajkumari Sharma, presents the pathetic condition of the people who bore numerous sufferings because of the bloody political division of the country. It is a powerful work of fiction which has been translated into English in a very lucid language by the eminent scholar and a scientist of great repute, Prof. (Dr.) Virendra Kumar Goswami. 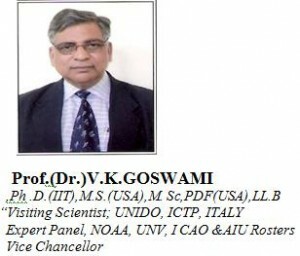 Dr. VK Goswami, did his Ph.D. from Indian Institute of Technology, Kharagpur MS from the University of Wisconsin, USA, Post Doctorate Fellowship at the University of Illinois, Chicago, USA. He is a ‘Visiting Scientist’ to United Nations Industrial Development Organization (UNIDO), ICTP, Italy, Expert panelist International Civil Aviation Organization, Canada and United Nations. Dr. Goswami worked at Space Science Engineering Centre, NOAA (National Oceanic Atmospheric Administration) at University of Wisconsin, USA. Presented Papers in the field of Chemical Technologies, Atmospheric Sciences, Space Sciences, Satellite Communication and Information Technology at International and National conferences held in India, USA, Latin America, South Africa, Canada and Europe. He is having 40 years of teaching, research and administrative experience at Home and Abroad. Dr. Goswami has been an Expert panelist of Association of Indian Universities, a national level accreditation body, Wing Commander in the IAF; Director General of Management Institutes, Founder Director/Director of many Engineering. Institutes for more than a decade before taking over the present assignment of Vice Chancellor . He was special Invitee by the World Meteorological Organization of United Nations, Geneva in 2001. He headed various delegations at National & International levels including International Conference on Metering held at Sao-Paulo BRAZIL, in 2003, .and in Jun.2005 the FEMA-Higher Education Conference on Emergency/ Disaster Management at Emmitsburg, USA & Chaired session SSC-2006 in, Czech Republic & Presented Research Paper on Control of Global Warming at ESF Conference,6-11 Jun. Innsbruck, Austria2009& France 2010 .